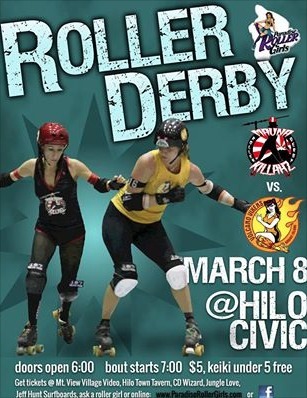 Hilo, HI March 2, 2014– It’s time to get fired up and excited about Hilo’s first roller derby bout of the 2014 season. The Paradise Roller Girls home teams, Mauna Killahz and Volcano Vixens, will be clashing in fierce competition and vying for the top spot. It all goes down Saturday, March 8 at the Afook­Chinen Civic Auditorium in Hilo. Come out and support your favorite of the rival teams by wearing red and black or orange and yellow. Doors open at 6pm, game starts at 7pm. It will be action-­packed, hard-hitting fun for the whole family. Tickets are $5, keiki 5 years old and under are free. Tickets available at Lucy’s Taqueria, Mt. View Village Video, Hilo Town Tavern, CD Wizard (add $1 surcharge), Jungle Love, online at www.paradiserollergirls.com, from your favorite derby girl, or at the door the day of the event. Concessions will be available inside, please no strollers, coolers, or beverage containers. Don’t forget to stop by our merchandise booths for your favorite Paradise Roller Girls gear while you visit the other vendors in the lobby. 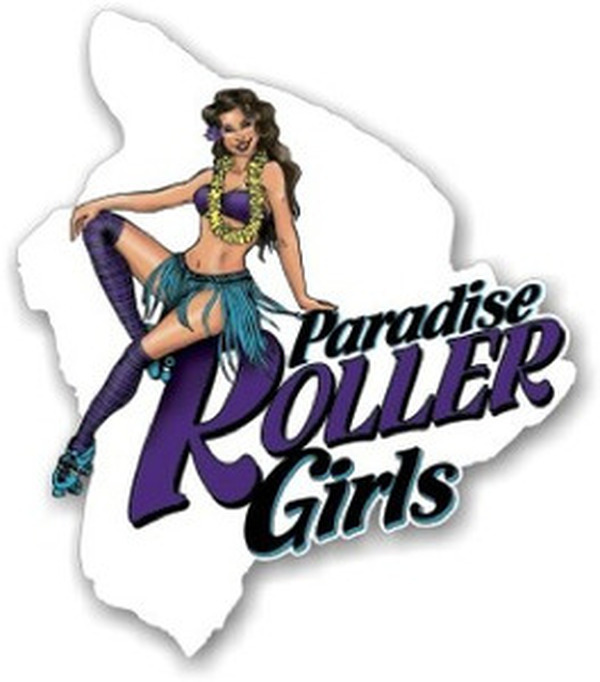 Paradise Roller Girls is a women’s flat track roller derby league based out of Hilo. PRG is an association of diverse skaters of all ages and backgrounds whose mission is to promote a healthy and athletic lifestyle who serves in our community through the alternative sport of roller derby. PRG has successfully completed the apprenticeship program and is now a Full Member League of the Women’s Flat Track Derby Association (WFTDA,) an international governing body for the sport whose mission is to promote and foster the sport by facilitating the development of athletic ability, sportswomanship, and good will among member leagues; PRG fully adheres to the association’s rules and guidelines. For more information on referees/officiating, recruitment, volunteer opportunities, junior roller derby, bout vendor booths and more, go to www.paradiserollergirls.com. Don’t forget to “like” us on Facebook to keep up with the latest roller derby happenings in our community.